I noticed a new post over at Chachic’s Book Nook,about great fictional couples. I have the first Lupi book on my Kindle and I really want to read that this year, which will leave out only the Ruthie Knox title. I like the foodie aspects of that one, so maybe I’ll pick it up, too. Of course I’m especially happy to see Natividad and Ezekiel on the list, even though their relationship is still, um, in the process of being defined. It is just killing me not to tell you all whether and how it works out between those two in the sequel. I am sure you mostly do not actually want to know ahead of time. I do want to mention a handful of the fictional couples I like best, though — and a handful of my favorite non-romantic relationships, too, because it’s way too late now to call this a Valentine’s Day post, so why stick to romance? Dag and Fawn in Bujold’s Sharing Knife series. They are too well suited in too many ways for the age difference to bother me, and in fact I like the additional complications the age difference adds to their relationship. While we’re on Bujold, how about Miles and Ekaterin? A perfect couple, right? And A CIVIL CAMPAIGN is practically a perfect book, too. I’m going to continue to nudge everyone who loves Kaoren Ruuol and Cassandra to try to find a copy of An Alien Music, because I bet you will love Jesse and Ben Hammond. I really love the slowly building relationship between Benjamen January and Rose in Barbara Hambly’s series, starting with A Free Man of Color. 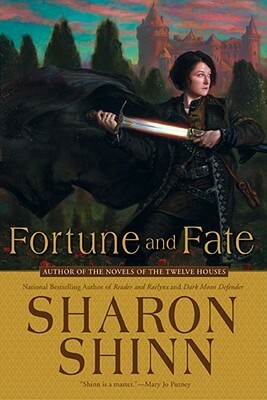 And one I may not have ever specifically mentioned before, but which works wonderfully well: Wen and Jasper in Sharon Shinn’s Fortune and Fate. That story is linked to the Thirteen Houses series, but is fairly independent and certainly can be read as a standalone. Of course Shinn almost always uses a lot of romance tropes when she writes, you probably already know that, but this particular story is one of my favorites of hers. I particularly love how Wen is the physically competent swordswoman and how Jasper is the bookish guy, and how they really have to work at understanding one another. Seriously, romance lovers should try this one — so should people who enjoy non-romance fantasy, because there’s plenty of other stuff going on in this book. I read that scene several times. It still leaps to my mind whenever I think of this book. I just think that line really captures a kind of day-to-day endurance after tragedy, that turns imperceptibly into the rest of your life. For non-romantic relationships, it’s hard to beat Alan and Nick from The Demon’s Lexicon by Sarah Rees Brennen, don’t you think? I just re-read Martha Wells’ Raksura trilogy, and so I’m still thinking about how much I love the relationship between Moon and Stone. Of course there’s also the excellent romance between Moon and Jade, but even that can’t beat the son-father vibe that gets going between Moon and Stone. You know I have also just re-read (most of) the Touchstone Trilogy, and I’m so impressed by the relationship Cassandra builds with those kids, especially Ys. One of the best mother-kid vibes out there, even though the age difference between Cassandra and Ys is not really all that huge. They’re only about nine, ten years apart, but Cassandra is such a great mother for those kids anyway. And, back to Sharon Shinn, I really loved Adele and Eleda, the mirror twins in A Truthteller’s Tale. A thoroughly charming story, beautifully put together, I really should re-read that, too. So many books, so little time! How about you, any particularly favorite couples or other relationships that leap to your mind? Cefwyn and Tristen, and Bren and Tabini, in CJC’s FORTRESS & FOREIGNER serieses. Also Cajieri and Bren. romantic: Seraph and Tier in Patricia Briggs’ RAVEN duo. Gentian and The Diamond in Host’s BONES OF THE FAIR which I finished last night. The whole family – lots of siblings – in L. Shelby’s ACROSS A JADE SEA, which I read in manuscript and is now officially published – as a trilogy – and available on Amazon. Also, the couple in it, Batiya and Chunru. (she’s an apprentice engineer on the first diesel powered ocean liner, he’s a castaway dressed in silk.) Shelby does family very well. You are SO RIGHT about Cefwyn and Tristen. I wonder why I didn’t think of them. I did think about the Foreigner series but didn’t quite want to include anyone — if I had, I might have said Bren and Banichi. Or even Bren and the dowager. I was looking for more central relationships, but I do really like how McKillip handled Morgan and Har. I think perhaps I’ll have to look up Across A Jade Sea. Good title, too. Miles and Ekaterin are a little TOO perfect. (Like Tolstoy says: Happy families are all alike; every unhappy family is unhappy in its own way.) I actually like Ivan and Tej better as a couple. But I agree that Civil Campaign is a fantastic rom-com. Non-romantic: Yes, Alan and Nick! And Daniel Ryves too. I love Eddis & Gen’s relationship in the QT books; it always seems to me that they understand each other really deeply. But then, I just like the relationships there in general–there’s a lot of complexity to all of them. Maddie and Queenie from Code Name Verity, for sure. Romantic: Pete Mack is saying heretical things about Miles & Ekaterin, which I am valiantly ignoring. :) I do like Ivan and Tej a lot, but I think A Civil Campaign works best when it’s read in tandem with Komarr (as it’s surely meant to be). I’ll have to think about this a little more–I feel like I should be coming up with better answers, especially for the non-romantic relationships, which are important to me in books. 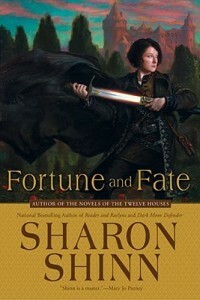 Also: that woman on the Sharon Shinn cove is drawing her sword backwards! You can hold a knife that way. But you will stab yourself with a sword. This kind of thing is really annoying on fantasy covers. P C Hodgell definitely agrees. Miles and Ekaterin get to be perfect! Perfection suits them! Cover issues can definitely be infuriating, but my assumption is always that the author knows that and is also infuriated. My default is: blame the marketing department. Although I suppose that these days, self-pubbed authors don’t get to hide behind the marketing department for bad covers. There’s a disadvantage of self-publishing I hadn’t thought of! So this. I actually get bored at a reread when Dag and Fawn aren’t the centre of the story and other characters take over for a short time – which I guess you need, considering Dag is developing a philosophy that will change their world if he gets enough support for it. I love that you also have a special spot in your heart for Jasper and Wen (Willawendis ^^). I keep rereading that book as a comfort reread (I tend to adore fantasy grown-ups being grown up and getting together nowadays, I don’t mind older female, younger man either ^^ – Wheel of the Infinite I’m looking at you), sometimes it gets me to reread the whole series. I do think that the first book has a fairly unrealistic female interior emotional development for Tayse, but Jasper in this book really seems believable being who he is as the man he is, warts and preconceptions and all. In the Vorkosiverse I have to say I think Aral and Cordelia top Miles and Ekaterin – maybe because Cordelia is so much more part of the plot than Ekaterin ever is, even in Komarr, hmm. But I loved that Miles always gravitated toward capable, amazing women in his love life. … that’s all I can come up with right now, heh. When you get around to reading the series, I think you’ll add Lily and Rule (and possibly Cynna and Cullen) to your favourite couples, too. I like the Mercy Thompson books, but except for River Marked I never felt that Adam really was as important to the story. The Alpha and Omega books work better that way for me. Kate and Curran work for me as well, although the relationship takes backseat to the storyline, because they are both very individual, very damaged and while they may be together their hangups believably show up repeatedly and they have to work at their relationship – AND the fact that physical violence can be part of that makes sense within the framework of the world and those two characters. Estara, yes, I hadn’t thought of Aral and Cordelia, but absolutely. I hadn’t thought of Kate and Curren, but I do love their relationship. I love the way he’ll come roaring furiously up to her and she’ll tap him on the nose and say, “Bad kitty. You’re scaring our friends.” SO unimpressed with His Furriness. I’m glad to see someone else who likes the Alpha and Omega series — I (slightly) prefer the Mercy Thompson ones, but I am do appreciate Charles and I like how his relationship with Anna works. I’m glad you also loved Wen and Jasper! I got kind of bored with Mercy Thompson; those books are a bit too formulaic. And I agree that Cordelia and Aral are a great couple. Also, I thought Byerly and Rish make an interesting pair. And I certainly enjoy Miles and Ekaterin, just that they’re too, well, perfect. De gustibus non est disputandum. I came back to add Aral and Cordelia, but someone beat me to it. Where are Kate and Curren and Lily & Rule found? Another non-romantic: the brothers in ATRIX WOLFE. THey don’t understand each other, but they love each other anyway. I’m having a terrible time coming up with romantic relationships actually….Ah, Cefwyn & Ninevrise, also from FORTRESS. A relationship of equals. the cop – Aaron? and The Queen of Hearts from FOOLs’ RUN, for his last scene with her. Lymond & Philippa in Dunnett. For the Shelby I mentioned yesterday, the first volume of ACROSS THE JADE SEA is titled SERENDIPITY’S TIDE. This info might make it easier to find. :-) Please forgive the length of the quote below , I do love the voice and the characters of this book, I hope others will too. The discussion before they get married “It could be difficult for you.” I wasn’t used to be married to anyone. And besides, people in West Borstev grew up assuming that their lives would be difficult. ‘Yes, I’m sure I want to marry you.” Are you certain that this isn’t just he excitement, the danger, or the prestige? That this is not that I’m… exotic?’ I stared at him in bewilderment. “Why would I want to get married because of that?” “I’ts romantic, ” Captain Melius said gruffly. “Oh, no!” I protested. “O don’t like that kind of novel at all.” Chunru’s eyebrows pulled together “Novel? What is this?” [digression on romantic novels and languishing heroines.] If I say you are the sort of man who refuses to burden others with his troubles, who will always treat me with respect and courtesy even when you are exhausted or in pain, who listens to my ideas, who won’t abandon me when things get rough, and who will give up even his own needs in order to see to mine – what part of that did I invent?” I didn’t believe in a perfect future, I wanted a husband who cold make the most of an imperfect one. Chunru stared at me wide-eyed, but clearly delighted. I laughed. “Did you think I could have gone through all that, and not learned something from it?” “I learned much about the metal that contains your soul also,’ he assured me. As as said, I read in manuscript for Michelle. I am pleased it is now available. I picked up Serendipity’s Tide yesterday. It’s self-pubbed, I believe? I would like to pick up the occasional self-pubbed title — as long as I have a recommendation I trust! Yes for Lymond and Phillipa! And there is some great dialogue when Cefwyn & Ninevrise meet, but I didn’t think of them, probably because they aren’t as central to the series as Tristan. Lily and Rule are in the Lupi series by Eileen Wilkes, which I haven’t read yet. Kate and Curren are in the Kate Daniel’s series by Ilona Andrews, which you should try! But read at least three books before you decide if you like it. I thought the first was okay, the second was better, and they really hit their stride in the third. The Mercy Thompson series didn’t strike me that way — but I haven’t ever sat down and read one after another, either. Reading them just as they come out may prevent them from having that feel. Kate and Curran are the eventual couple in Ilona Andrews Urban Fantasy series (they’re basically calling it Kate Daniels) which always starts with the word “Magic”. Lily and Rule are the main couple of the paranormal romance/urban fantasy/suspense series World of the Lupi by Eileen Wilks, which Chachic introduced to Rachel and I introduced to Chachic on Goodreads, hehe ^^. My particular attraction to that series is the fact that family is a BIG part of the romance of the two people and that both are very competent and self-assured, so they have to negotiate how their relationship works without creating an imbalance. There’s a totally believable twist for the soulmate trope, beautifully showing that just because some magic forces you into intense attraction it doesn’t mean you fall in love with them. There’s a well-crafted werewolf lore (which works just as well, if not better – I love the additional details offered during the various books – than the Mercy Thompson werewolf lore) which has the additional attraction that the lupi of the book have a historical reason for respecting women. Oh and Lily is American Chinese. And has an amazing grandmother. Kaylin and Teela, Kaylin and Tara, Kaylin and Severn (although that might turn into a romance at some point), Kaylin and most of her chosen family at the Hawks in Michelle Sagara West’s Elantra series. Jewel and her den in Michelle West’s Essalieyan books. The group of friends in her current ya paranormal fantasy series Queen of the Dead, added props for including an autistic member (I expect it was an homage to her oldest son, it should read believable to people who are in that spectrum in any case). I find MSW one of the most gifted authors for family/friend relationships. They are always an important part of her books. Inda and Evandred, Inda and the Fox, Inda and Jeje, Inda and Taumad in Sherwood Smith’s Inda series: he’s one of the blessed people who have a natural charisma and an interest in the opposite person which makes people gravitate toward him. A little too effective at pushing books, there, Estara; my TBR pile just clicked up several notches. I don’t think I’ve read enough MSW yet. OOps, my suggestive eyebrow wiggle got spam-eaten. Fair enough ^^. All my favourite sf&f authors should read each other. The Elantra series in particular is a great comfort reread series, as well. Be aware that none of the three series I mentioned are completely finished yet. The six book Sun Sword arc of the Essalieyan series is probably the most rounded experience you will find if you are a reader who doesn’t like reading a series until it is finished. The single books all have their own arc, though. Okay, now I’m just linking it, heh. Takes a bit away from the effect, but is probably safer. I appreciate the eyebrows! And the warning that the series aren’t complete. Though a six-book set sounds complete enough. The six book set covers one story arc in a much more extensive vision, which started with the HUNTER duo, which I know you read. It does come to a reasonable conclusion of the arc. The current Essalieyan series, HOUSE WAR is the one I’ve occasionally grumbled about where I’ve lost interest in the main character, but everyone else and everything else is interesting. And the QUEEN OF THE DEAD YA set has two out of three published, so it isn’t too bad to start with. Shorter books, too. West/Sagara has a real problem with length, but when I wonder if she could cut, I usually don’t see anywhere to do so, without crippling the story. The Teen and I both read QotD and the ELANTRA series. My favorite summing up of the heroine of ELANTRA is that she’s a Mary Sue where all those Mary Sue elements make life more difficult instead of better. (except beauty. not much for charm, either. But Chosen One? oh, yeah.) Unfortunately while the Teen and I think we see an overall story arc, things I’ve seen the author write about the series give the impression she doesn’t see that arc. But there are a whole lot of relationships, good, bad, difficult, and all real in that series. And you can get the first three on Kindle for a pretty good price as an omnibus. … Good dragons, too. Hmm, I liked the first book or two of House Wars. But the books are really, really long. Too long, in fact, for me: I don’t think I finished the third book. (Robert Jordan started coming to mind.) And the “Cast” series just doesn’t do much for me, at all. How about relationships between humans and non-humans? I’m thinking of the relationship between Captain Laurence and Temeraire in Naomi Novik’s books. It’s the most important relationship in the series. I was also really impressed with S.M. Wheeler’s 2013 debut SEA CHANGE. Parts of the book are horrific, but the relationship between the protagonist and her charming and intelligent friend, Octavius (a kraken), won me over completely. It was so refreshing to read a coming of age tale with no romance but a really strong friendship at its core. I almost mentioned Lawrence and Temeraire — I should have, too, because it definitely fits. I just saw this post! Hahaha yes, I wouldn’t want to know ahead of time what will happen in the sequel but I’m dying to read it. An Alien Music is already on my wishlist. :) It’s out of print though so may take a while for me to locate a copy. I read the first Sharing Knife book and while I enjoyed it, I didn’t love the romance as much as you did. I’ve only read Young Miles so I haven’t gotten to the part where he has a romance. Several reader friends have also mentioned that his parents’ love story is a good one. Yes, I loved how Cassandra’s (and Kaoren’s) relationship with the kids developed. It was such an unexpected turn of events for her but she handled it really well. Actually, I think the third and forth Sharing Knife books are the best — but the second is the one I like the least, so I’m not sure you’ll want to get through it in order to reach the back half of the quadrilogy!